Low effectiveness due to the use of synthetic ingredients with poor bioavailability. Synthetic Vitamin A and Vitamin B12 (Cyanocobalamin) may cause mild toxicity if taken in high doses over long periods of time. Missing key ingredients, which are common to higher-quality multivitamins. With an Effectiveness Score of 7.8 on a 10 point scale, the Solgar Omnium multivitamin by Pfizer ranks number 13 out of the 100 multivitamins we have evaluated. How does Solgar compare with other multivitamin brands? 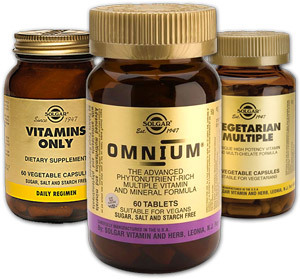 The MultivitaminGuide.org website offers Solgar Omnium reviews and direct comparison between the Solgar Omnium multivitamins and of all major vitamin supplements available on the market. Some of the unique aspects of this guide include comparison of the Solgar Omnium multivitamins with 100 other vitamin supplement products, including popular brands such as One-A-Day, GNC, Equate, Kirkland, Nutrilite/Amway, Nature Made, NOW Foods, Melaleuca, Puritan’s Pride, Herbalife, TwinLab, and Walgreens. The table below provides a summary of the Effectiveness Scores of some of the more popular vitamin supplement brands available on the market, including the Solgar Omnium multivitamins.